Outside Inn is an inn and a tavern in Elden Root. It is located near the southeastern entrance to the great graht-oak tree. 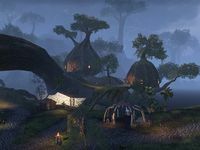 The inn consists of two Bosmer-style tree huts and an outdoor area where many of the patrons can be found. Indithil's booth is situated near a ramp to the main area. The booth contains several barrels and a wine rack. Up the ramp is an open-air terrace where Fasana, a bard, plays the lute and sings for the inn's guests. The lower-level hut contains a cooking fire and several urns and bottles that can hold drinks or solvents. Fradion, the innkeeper, can be found here. The upper level hut has several sleeping spaces. Enthilin resides in this part of the inn. Several patrons spend their time here, eating, drinking or reading. From time to time Cygwenn attempts to play the lute. There is another cooking fire in this hut, two bookshelves, several barrels, yet more bottles and a backpack.